That day that everyone loves to hate. Yes I used to be one of those people who dreaded leg day. But I have turned over a new leaf my friends, and I’m now fully embracing leg days. I have learned to love that next day feeling of soreness. When simple tasks such as attempting to sit down on the tiolet is a process. Squatting is the focal point of any leg workout. If you are going to master and be consistent with one leg exercise, the squat should be it. That’s why lately when I do leg workouts I usually start with squats so my legs are fresh when doing them. I also like to drop the number of reps to eventually end up at my max weight. I usally start doing the first 20 reps at 95lbs and end doing a set of 5 (or sometimes only 3 ) at 235lbs. You want to push yourself so that on the last set you struggle to make those 5 reps. If you are just cruising and can easily hit those 5, it’s time to go up in weight! 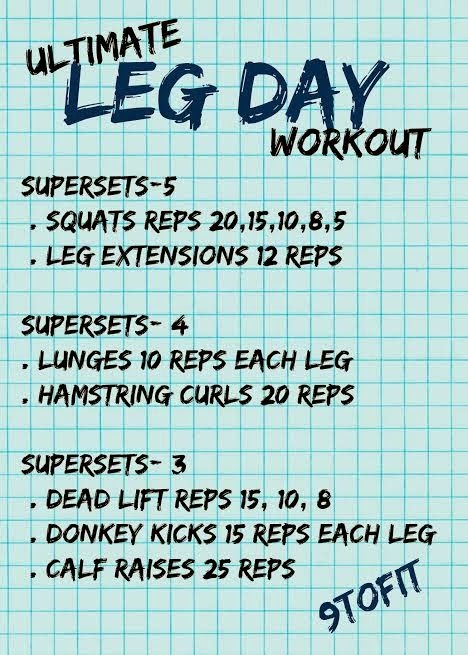 Love or hate leg days? !